Happy memories of eating at The Pie in Salt Lake City, Utah. It's a dank underground hang-out that makes some of the best pizza in the United States. Spend some time there and you'll find yourself writing on the walls, choosing some music from the jukebox, and wishing someone (especially that cute guy in the corner) would just look back. Always order a smaller pizza than you intended so you have some room for their delicious Cinn-A-Part dessert pizza. It is heaven where heaven would never dare tread. Or come to my house and I'll make you my version - I call them Cinnamon Twists. They're reminiscent of your visit to The Pie and you'll be glad you came by for a visit. But please don't write on the walls. Mix the water, yeast, and sugar. Let it set until the yeast activates (5 minutes). Using a mixer with a dough hook, add oil, salt, and 1 C flour. Mix well. Add flour ½ cup at a time until the dough is slightly sticky and no longer clings to the bowl. No need to let it rise. Roll the dough thin into a rectangle shape. Cut the dough into ½ inch strips. Preheat oven to 375°. Melt the butter in a shallow bowl. Mix the sugar and cinnamon on a large plate. Dredge a dough strip in the butter. Coat it well in the cinnamon mixture. Fold the strip in half (I stretch it a little) and twist it. Place on a parchment-lined cookie sheet (you can skip the parchment if you’d like but it helps with clean up). Repeat, repeat, repeat. Cover and let rise for 15 minutes. Cook for 40 minutes. They will still look a little pale but the edges and tails will be golden. with a fork. When the twists come out of the oven, drizzle the icing over them and enjoy! I made applesauce yesterday and it is delicious! It doesn’t taste like that yucky, bland stuff they sell in the store. I’ve often wondered how they make theirs taste so bad! Mine tastes a lot like apple pie – without the crust. When my children were babies, I would feed them homemade applesauce instead of commercially processed baby food and they still love it today! It’s that good. This is your secret recipe for applesauce because (here’s the secret) there is no true recipe for applesauce. If you get the right apples, you honestly can’t go wrong! Applesauce is super easy to make; especially if you use a Victorio Food Strainer and Sauce Maker to do the peeling, coring, and mashing for you. Read here to learn why you need one of these. If you plan to can this stuff (which I highly recommend) 1 bushel of apples will render about 20 quarts of applesauce. Also, fyi, a paper grocery bag filled with apples is approximately ½ of a bushel. That information comes in handy if you’re picking your apples off the tree in your backyard. If you aren’t into canning, you can make a small batch of applesauce – just use 10-12 apples and get cooking! Add cinnamon if you wish. I add about ½ Tablespoon – taste it – and go from there. Add 4T lemon juice (per quarter bushel) if you are using windfallen fruit and are canning. This increases the acidic level of your fruit to keep it fresh. Apples picked off the tree do not require lemon juice as they come by a higher acidic content naturally. Add an optional pinch of nutmeg just to make it interesting. Use McIntosh or Golden Delicious apples. These make the very best applesauce. The McIntosh is a sweeter apple and you may not even need sugar is you decide to use this apple. It’s in season in late September and early October. The Golden Delicious apple makes an applesauce that is a little tart. If you love a tart apple pie (not to be confused with an apple tart), this is the apple you want to use. If you prefer sweet applesauce, you can use golden delicious apples and simply add more sugar. It makes a very yummy sauce! Don’t waste your money on the perfectly shaped apples. You’re going to grind them up! This year I could choose between perfect pretty Grade A apples ($39 for half a bushel) and less pretty Grade B apples ($9 for half a bushel). This can save you a ton of money! Use a Victorio Food Strainer to save yourself time, grief, and shriveled fingers. There is also another brand, Norpro, that costs about the same – or more – but doesn’t look like it has a lot of the features that I enjoy with my Victorio. They both sell for just under $50. If you like lumpy applesauce, pick up the Accessory Kit that contains the Salsa Maker screen. I just use screen that comes with it originally and, if I want lumps, I hand mash a few apples and add them in to the mix. Have you had a chance to treat yourself to Rice to Riches? It’s a specialty pudding store in New York that exclusively sells rice pudding. I love rice pudding! They sell around 20 different flavors; the Rum Raisin is my favorite. But I’m not always in New York so I’ve had to learn to fend for myself. If you love rice pudding, you’ll want my recipe! If you’ve never tried rice pudding, this is the recipe you want! Baked or boiled? Everyone who participated in my taste test preferred boiled. The boiled version is more pudding-like, while baked rice pudding is more like a lumpy custard. Double boiler? Yes! Use a double boiler to prevent scorching. Cooking your pudding over direct heat is possible but isn't recommended. Which grain of rice? Medium grain is best but long grain rice is pretty great, too. There wasn’t a ton of difference, to be honest. Vanilla Extract or Vanilla Bean? Definitely use the vanilla bean. The taste is amazing and the tiny freckles left by the bean makes the pudding look sweet. Raw or cooked rice? Use recipes that call for raw rice. When rice is cooked in the pudding mixture, it picks up the flavors of the pudding. Already-cooked rice stands out as a separate entity in the pudding; which is distracting. A delicious rice pudding has just the right amount of creaminess and spice. Rice is its own thickening agent – which is what provides the creaminess in this dessert. This pudding (like most old fashioned puddings) is a little time intensive – it will take you approximately an hour of constant stirring. So grab a loved one to take turns with the stirring or pick up a good book to distract you. Using a double boiler, stir the Milk, Vanilla Bean, Rice, and Salt over medium-high heat for approximately 50 minutes, stirring (for the most part) constantly. The mixture will magically thicken and look like a pudding – waiting for this to occur is the trick. As soon as the mixture has thickened, add the raisins and simmer for 5 more minutes. While the raisins simmer, mix the egg yolks, sugar, cinnamon, and nutmeg in a separate bowl. Whip ¼ C of your hot mixture into the egg yolk mixture. This will temper the egg mixture (i.e., keep the eggs from cooking when you mix the two together). Now add the egg mixture into your double boiler and stir well. Cafe Rio is a fairly new Fresh Mex restaurant that features only the best food in town! If you live on the East Coast, your only exposure to this guilty pleasure can be found in Maryland and Virginia. But you who live in Colorado, California, Arizona, Utah, Idaho, Montana, Washington,and Nevada know what I'm talking about. Taste it once and you'll be back for more....and more and more. There is a lot of delicious food on the East Coast but Mexican food - good Mexican food in general is not easy to find. And the Midwest? Please. If you know of a fabulous Mexican food restaurant near you, please leave it's name and location as a comment so we can all enjoy! 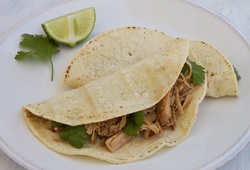 In the meantime, try out this recipe for Pulled Pork Barbacoa. Barbacoa may be a little misleading since this meat isn't steamed to tenderness. But still. After searching high and low for the perfect recipe, we finally found it! We never post a recipe we haven't made and tried. It took some searching (thanks, Mom)- and finally some tweaking of a fairly decent one we found - to get this to you. Cook roast in water and 1 t salt (to cover) for 4 hours over medium heat (use crock pot if desired). Remove roast and discard water, reserving 1 C of water. Cut roast into thirds and place in the bottom of the pan or crock pot. Mix the remaining ingredients together and pour over the roast. Add tap water to cover and cook over low hear Pour out water reserving about a cup in case the final pork is dry. Cut roast in thirds and put it back in the crock pot. Cook over low heat for 4 more hours. Using forks, shred pork (remove any fat and discard). Add pork back into the juice and add extra cumin to taste. Use this pork in tacos, burritos, chimichangas, enchiladas, tostadas, and quesadillas. Or just slide it into a toasted bun and enjoy it! You won't be sorry. This is really good stuff! If you prefer, you can roast this pork. To do this, pour the mixture over a raw roast, cover and bake at 325* for three to four hours. These cookies are fun for the family as a quick after dinner treat or you can whip them up to share with your book club. 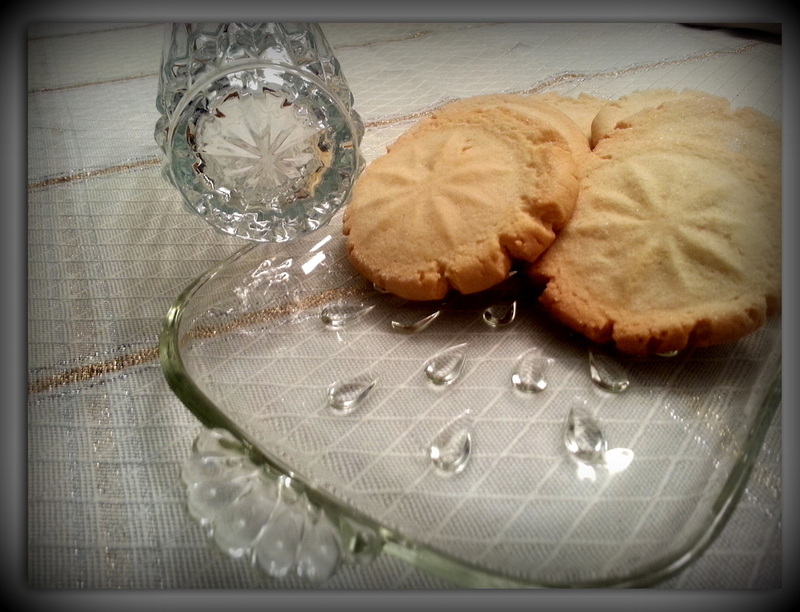 The simple, crunchy cookie is filled with a buttery taste accented by a breath of salt – unusual and delicious. 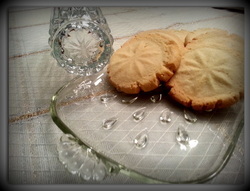 I used a glass with a star-patterned bottom as my press; it left our cookies looking like adorable, edible sand dollars. The batch will yield approximately 4 dozen cookies so share them with your friends and neighbors. Cream together Butter, Vegetable Oil, Sugars, Vanilla, Water, and Eggs. Combine dry ingredients and slowly add to mixture. Your dough should be smooth yet not at all sticky. Mix ¼ C sugar and ¼ t salt on a saucer. Choose a drinking glass or cookie press – press it into some of the dough to get it a little sticky. Now dip it into the sugar mixture and then firmly press into the center of each dough ball; pressing until the dough is about ¼ inch thick (i.e., thicker than regular pressed cookies). Your dough will crack a bit and smoosh out beneath the edges of your press. Remember to dip your press into the sugar/salt mixture before you smoosh the next dough ball! Bake at 350° for 10-12 minutes. The cookies should just barely be browning around the edges. Move the cookies to a cooling rack and try not to eat them all before they cool. Makes about 4 dozen cookies. If you’re like me, eggnog is an inevitable Christmas tradition. Eggnog purchased at the store is delicious, until you read the packaging and realize it’s chock full of High Fructose Corn Syrup and stabilizers. Then it doesn’t taste quite so traditional. But it’s Christmas! We set about finding perfect egg nog recipe just for you. It needed to exceed the goodness of store-bought egg nog, lack high fructose corn syrup, and be safe. 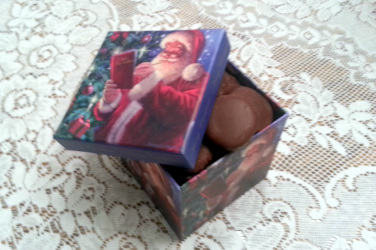 It’s still fattening and yummy and it’s alcohol-free (so you can decide if you want to add the brandy or not). We succeeded! Even people who don’t like egg nog have liked this recipe. This is by far the best eggnog you will ever taste! Whip the eggs, sugar, and vanilla together until creamy. (If you kind of hate the slurpy egg whites, use an electric mixer to whip this mixture.) Pour into a double boiler and add the whole milk. Cook to 160 degrees (if you aren’t using a thermometer, the mixture will coat your stirring spoon and be about as hot as a cup of cocoa). Remove from heat and slowly stir in the Whipping Cream. Add the ground cinnamon and nutmeg. Pour into a container and refrigerate until cool (but save one mug of it for instant enjoyment as this drink is delicious both warm and cold). If you like, add whipped cream, alcohol, extra milk, whatever when serving. *If you used egg whites for Thanksgiving, you can make this egg nog using the remaining yolks. 2 yolks = 1 egg. **We tried this recipe using 2% milk and half-and-half in an effort to reduce fat. The eggnog is thinnish and just not as good - but better than nothing.